Which Tobacco You Don't Have Is At The Top Of Your "MUST TRY NEXT" Want List ? I’m trying Black Frigate for the first time later today. Looking forward to it. Apparently it has many fans here. Doblone d'Oro is the latest on my to-buy after I stack a few pounds of my beloved >= 2007 blends. Great thread OP. I’m interested to read all the responses. C&D, GLP, McClelland (I know..), Peretti and even locally made Doblone d'Oro. But none of these have been or are available at B&M’s here in DK or neighbour German cities, as far as I know. Hopefully I will visit USA again. Last time was a biz trip and in my spare time I only visited an impressive cigar shop in Houston and at that time (1997) I had no idea about above US pipe tobacco. Mid 20th century Capstan Blue: I may never find it, but it is the only tobacco on my MUST TRY NEXT list. Apparently it has many fans here. 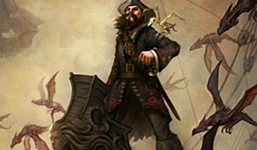 We're not fans, we're pirates! 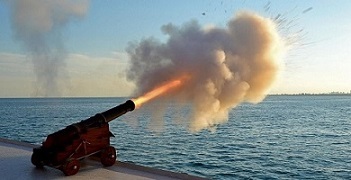 Yaaaarrrrrr! I've been enjoying a few blends from The Country Squire lately, and I'll be trying more in the very near future. It's a tossup between Manil Reserve du Patron and Manil La Brumeuse. I love Manil Le Petit Robin and have been wanting to try both of these to see how they compare. Lately I've been testing the Lakeland waters with GH Ennerdale and Bob's Chocolate Flake. Next...more GH blends. I shouldn't even post, having so much interesting "stuff" on hand, and smoking glacially slowly, and healing from some oral surgery that has me not smoking at all right now. However, since I'm still posting, I'll say I'm still intrigued with Presbyterian since I have doubled back and explored some milder blends. Several of the Peterson tin and pouch tobacco keeps calling; I enjoyed a sample from a member of 3'P and wouldn't mind ordering that. But if I listed everything I have unopened, I couldn't even write this. So much at my finger tips, not to even name the Dunhill and a few McClelland blends already at their unopened aged prime. 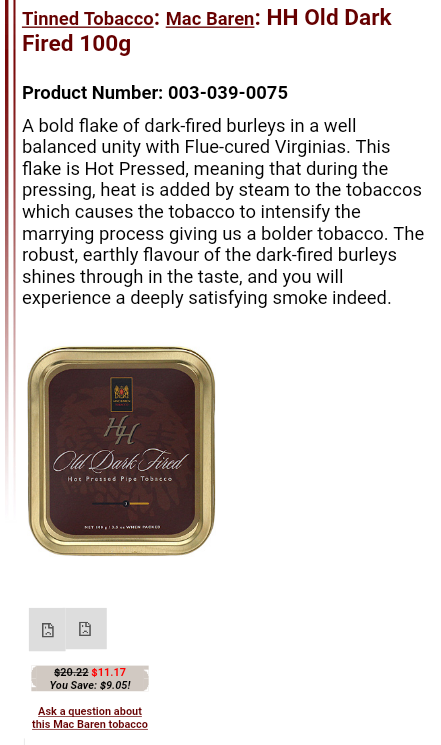 For a number of years, I have been quite the fan of Mac Baren's HH Old Dark Fired and I am yet to try the newer Bold Kentucky. Consequently, it's on my next order list. As far as things I currently have on hand that I plan to try once I smoke up some of my currently open tins: Cornell & Diehl's Exhausted Rooster. As far as things I intend to buy soon: Drucquer & Sons' Inns of Court. Chatham Manor. I ordered a tub yesterday from P&C so we'll see. I hope I won't be disappointed. Most of the tobacco I have I haven’t tried yet. Mostly because it’s aging in the cellar. None. My pipe and tobacco buying is finished. Mac Baren Plumcake. Just got a tin and had to give it a try...slowly. Hmmmm. That one and The Solent Mixture are a couple of my favorites. Haven't experienced the much talked Mac Bite with either. No more blends for me. Its taken some time,but I'm right where I want to be. The last of my "Want to Try" was "Codger Blends" and now I've been there, done that. I have enough variety to scratch the itch. I'm very, very fortunate. Capt you are right. I don't get any bite either. Maybe I just don't freight train any more. 5 tins in the cart put haven't pulled the trigger yet. It's getting fantastic reviews and is favorably compared as a replacement for Three Nuns original prior to the change. Need a couple of pounds of ODF first. HH old dark fired is in my cart still trying to decide what else im gonna add. Okay, guys, sorry for the tangent but please stop buying MacBaren’s HH ODF; flake or rr. It’s really nasty stuff. It’s terrible and disgusting and shouldn’t be anywhere in your home. I have a... friend... who has it on good authority that HH ODF is a threat to intelligent life everywhere in the cosmos. I’m the only one that I know of who has the proper equipment to store this decidedly unpleasant blend safely, so please, if you have any of this wretched tobacco please message me and I’ll pay your shipping fee so that it may reside safely in my specialized containers. And no, I’m not counted as intelligent life. I went through most of my brain cells in the 80’s. SG St James Plug. Hoping by next weekend it arrives. Those of us who've been cellaring for a while had a much less expensive time hoarding. This is from 2012. Not one specific blend, but I've been meaning to purchase and try the Lovecraft themed lineup from C&D. Seems like Black Frigate is popular so I'm curious. And I saw folks talking about Boswell Northwoods. Both of those are fantastic. I think Boswell's has a sampler you can order. 4 or 5 one ounce samples for a set price. That's how I discovered Northwoods. Just be aware Boswell's uses a slightly sweet topping but it's done very well and doesn't hide the base blend. I'm set. After having tried hundreds of blends over the years, I've stocked up on what I like. That said, if a tin or two of Rattray's made or McConnell era HOTW, or a couple of others, or A&C Peterson made Escudo, showed up at a price that wouldn't make me wince, I'd add them to the pile. Don't think I'll ever have to worry about that opportunity. Thanks for the info Panhandler. I was looking at tobacco reviews and Boswell has something called "Railroad Station" which, the name alone is awesome. So the sampler is probably a good way to go. One that I really want to try is Bothy Flake, but I haven't found any for sale yet. EDIT: Just after writing this I found it at "Mr. Snuff", but they want $35 for it. Hard pass. Some of the blends that pop up on lists like these interest me. 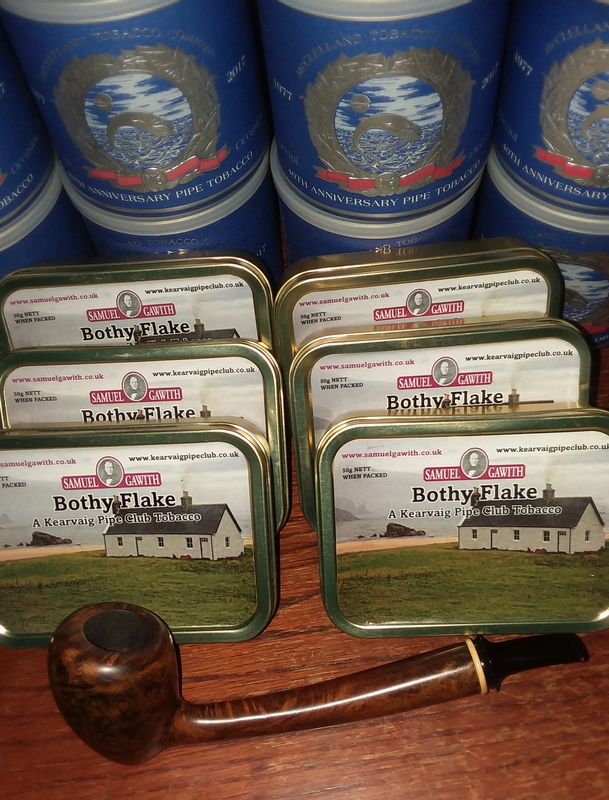 Bothy Flake popped up on the radar awhile back and I purchased these in 2014. Don't hear that much noise about it anymore. Bought HH ODF by mistake when I really wanted Bold Kentucky. Anyone else have trouble telling these 2 apart? Anyway the ODF is in the cellar and the Bold Kentucky is still at 33,000 feet somewhere over the Pacific Ocean. Should be on my door step in a couple of days. Somehow, I missed the opportunity to try the Penzance and Full Virginia Flake in the past, so these 2 are on my 'must try' list. Not at all. Tobacco is beyond the price I'm willing to pay now, and I haven't bought a pipe since September. My interest in barbering has buried any pipe and tobacco collecting interest. I recently threw out some pipes that weren't getting used. Well, if you have enough tobacco (trying not to laugh) then you are good to go. Why are you throwing away the pipes, sir? What's funny about that? I can no longer afford the prices they are asking. Why are you throwing away the pipes, sir? They had fallen out of use. Ah, I was right. September was the last time I bought a pipe. Embers, have you tried it yet? Yeah, originally had 10 tins, but haven't smoked it for a few years. I was just joking. I was thinking that you have enough tobacco, so that was the reason of you not buying anymore. Besides, we always make jokes of ourselves (pipe smoker stereotype) how we are not going to buy tobacco or pipes anymore. I know, but recent price hikes have made me glad that I started putting back tobacco years ago. I should be set for several decades now. Scares me to think what tobacco prices are going to look like in the next few years. I have a drawer full of tobaccos I haven't tried. Next will probably be Grousemoor and HH Pure Virginia. Next to purchase are Fribourg & Treyer Blackjack, McConnell Red Virginia and Samuel Gawith Cabbies Mixture . Chatham Manor is great. You will love it. I want to next try Viprati. I'd like to try the Cult series blends. I see P&C has the full line on sale right now. And I saw folks talking about Boswell Northwoods. Northwoods remains my favorite English. Amen brother. I'm done buying, with the exception of the very seldom replenishment of something that's run out. I really don't know how much I've accumulated, but it's a couple of decades worth, given how much my consumption has declined. I've always bought more blend than I smoke, so I can coast for quite a spell. Probably have better than I'll be able to buy in a few years. I'm getting to that point. I have plenty of different stuff, but every week I find myself in a b&m and/or online vendor buying something new that looks interesting. When I'm talking to the cashier in the b&m I feel like I have to comment about it, like a fat guy in a donut shop..."I know I really shouldn't be doing this, but..." Or sometimes I'm buying more for completely unselfish reasons, which is the lie I tell myself: "I just need some pipe cleaners, but it would be wrong to not buy some tobacco while I'm here. I need to do my part in supporting small local businesses." You know you have a serious case of TAD when you have some of about 85% of the blends mentioned in this list.Yikes! My next acquisition? Believe it or not...Velvet and Mixture 79. After listening to The Artful Codger on The Pipe and Tamper podcast this week, I feel like I should at least try them. Sutliff Blacksburg sounds interesting to me. I'm awaiting an order to try. Sutliff's Blacksburg is a tantalizing, all-black mixture of Cavendish and Burley tobaccos, topped with slight notes of fig, prune, and rum. At the moment, I'm also pretty satisfied that I've given all the genres a good try, so I'm not looking at anything else. Curiosity my get to me at some point down the road but I've got a lot of poundage waiting to be smoked and I think it's time to settle into it all. I told myself I was done buying any tobacco in July of 2016. So what do I do, I have to go try blends like Curly Block, Salty Dogs, Butera Dark Stoved and Doblone d'Oro in the beginning of 2018. It is now Feb 2019 and I am saying again, i am not going to buy any more damned tobacco. Buying aged tins from Pipestud doesn't count. I'd pay good moneys for a bowl of something from 1600's England, discovered well preserved, needing only some hydration. Just typed that into eBay search and found three crocks with just a few ounces of tobacco from the 1600's in England. The odd thing is, though, they were stamped "Made in China"! I'd bet, though, that if somehow such were perfectly preserved (not gonna happen), it wouldn't be as good as any of your top 20 favorites. No more new pipe tobacco blends or even pipes for that matter. I know what I like and I still have tens of new blends to try in my cellar. I'm done searching for the perfect tobacco mixture. Just curious virginialover. When was the last time you bought a blend that was new to you? My promises to myself like yours have all lasted about as long as a New Year's diet. When was the last time you bought a blend that was new to you? Now there's an interesting question. Going to start a new thread for it. Like several others, my cellar is loaded with untried blends. I haven't even tasted all of the open stuff I have laying around. "Just curious virginialover. When was the last time you bought a blend that was new to you? 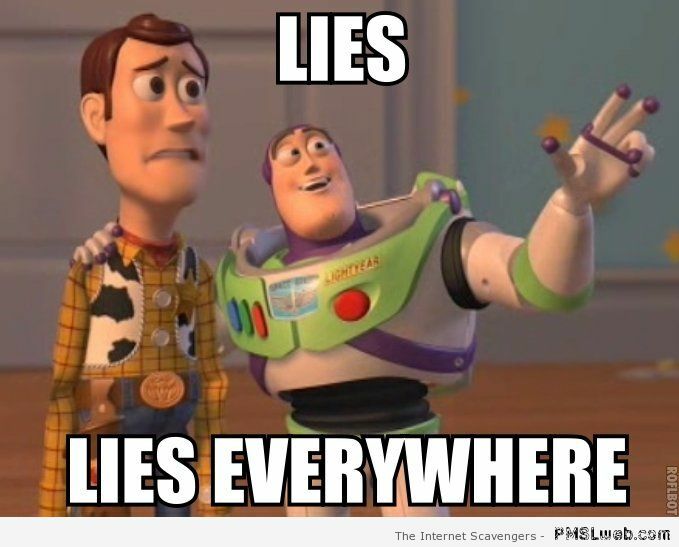 My promises to myself like yours have all lasted about as long as a New Year's diet." 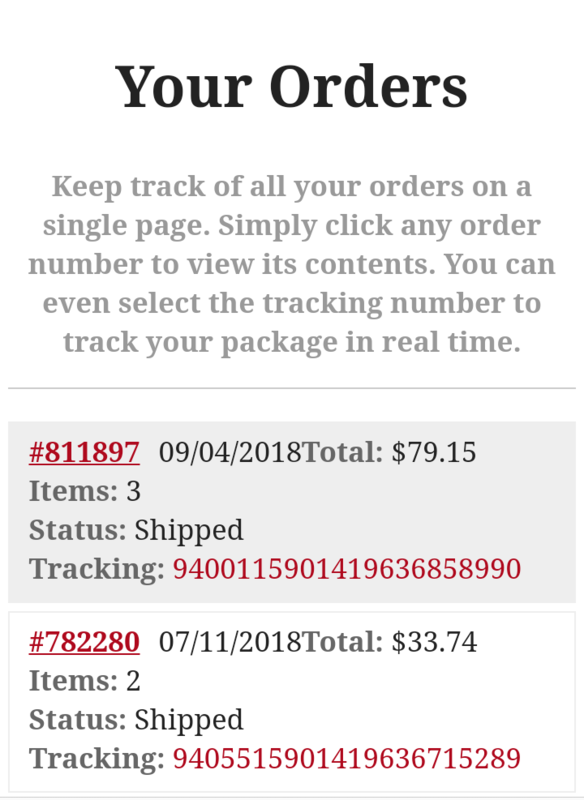 The funny thing is that I'm really done trying new pipe tobaccos after my last order a few weeks ago. That doesn't mean I'm done buying but I'll concentrate on my favorite ones and as cheaply as possible with fewer orders and far between. The amount of tobacco I have is enough for a lifetime since I'm an occasional smoker. HU 5 Year Anniversary Blend it’s topped with a balsamic vinegar, I’m really looking forward to trying it, it’s on its way and should be here any day now.